Learning doesn’t just happen in a classroom but in the world all around us. We recognise this and provide many opportunities for students to venture beyond the four walls of their classroom to learn and play. and our nature spaces have been developed to facilitate both class learning and self-directed play. These different experiences help our students understand that learning happens all the time and in all sorts of places, opening their eyes to a future of lifelong learning. At Redeemer, we recognise the growing amount of research that emphasises the need for children to have regular access to the natural environment. The benefits of connecting with nature are wide and varied and include greater resilience; improved concentration and motivation; increased creativity; enhanced social skills; reduced conflict; and a stronger appreciation for the environment. On our school site, we are blessed with a diverse assortment of natural spaces for play and authentic learning opportunities to occur outdoors. 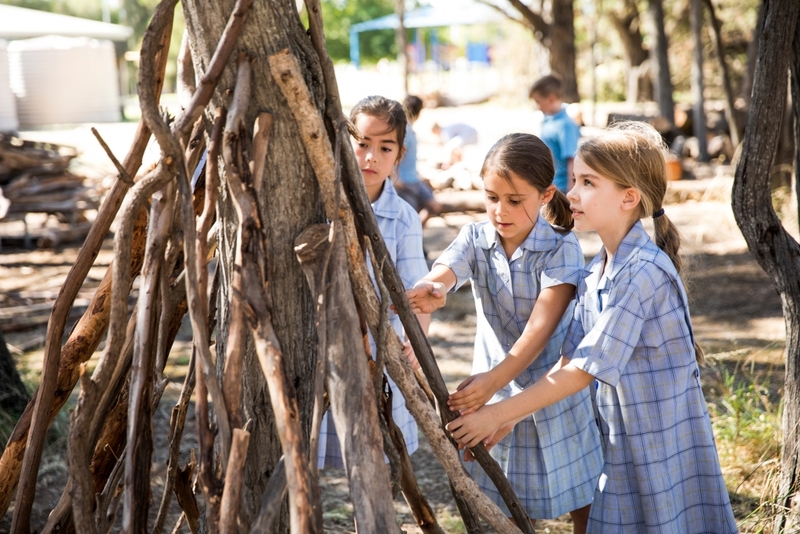 These experiences range from exploring local and endangered plant species in our heritage listed bush block; to building and creating structures in our loose part play area; and soon, students will have access to a brand new, purpose-built play space made out of natural materials. Camps are an essential element of children’s primary school journey and their development into confident and capable people. From Year 2, Redeemer students participate in a well-structured and developmentally appropriate camps program that enables them to reinforce and extend their learning and social skill development in a non-school setting. Students grow from spending a night away from parents at a school sleep over in Year 2, to being courageous enough to travel with their classmates to Canberra for a week in Year 7. These experiences will be lifelong memories for your child and have immeasurable benefits for their social skills and confidence.